The emergence of Somabay as a top end tourist destination on Egypt’s Red Sea coast has been due in no small part to Abu Soma Development Company’s desire to provide visitors with first class sporting amenities like this Gary Player golf complex – it's hard to believe the course was previously a military base that had to be cleared of land mines before construction could begin. 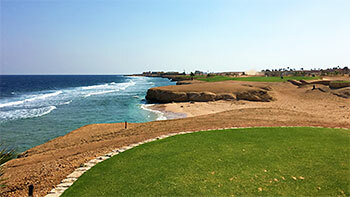 The 18-hole Cascades at Somabay was far ahead of its time when it opened in 1998, in fact it was the first championship golf course in North Africa or the Middle East to be designed by any of the modern day “Great Triumvirate” of Gary Player, Jack Nicklaus and Arnold Palmer. Kikuyu fairways are routed in an extended figure of eight with each loop of nine holes returning to a clubhouse in the middle of a peninsula that juts out three miles from the shore into the sea. Two of the more inland holes stand out here, one on each nine. The first is the 614-yard 2nd hole, a monster to tackle so early in the round and it takes its name (“Lions in waiting”) from the pair of lion-shaped sphinxes that loom over the entrance to the hotel behind the green. On the back nine, the other hole of note is “Dilemma, dilemma” at the par four 12th, which can be played in one of two ways due to its split fairway, hence its name. But there’s no doubt the best holes on the property are those by the seaside at 5 and 6 on the outward half and 14 and 15 on the inward circuit. The short 5th, entitled “The Pebbles of Soma", features a continuous narrow bunker on three sides of the green whilst the 186-yard 14th (“Second signature”) demands a tee shot played across a gully to a wide but shallow green protected by three intimidating bunkers. Played at Soma Bay Cascades again this year at fall school holidays. We had a 10 handicapper, a 6 and a 4. All of us enjoyed the course immensely and it was in very good condition. Windy as usual, up to a 4-club wind near the ocean and a bit less otherwise. We ventured off the back tees and it was quite a challenge at 7000 yards in that breeze. But it has been well thought out design-wise and even in those winds it is playable. I have now visited this hotel 3 times in 5 years and have logged around 10 rounds on the course and have enjoyed all of them. A great place to play and well presented. Sadly, this course barely rates to be called "average". The greens are infested with multiple alien species making putting almost impossible outside 10 feet. The bunkers are even worse, being mostly hard dirt littered with rock and pebbles of all different sizes. The blue tee boxes are hacked to buts, while the white tee boxes are unused. The practice facility involves hitting off mats, not grass. Handicap requirements are not enforced and visitors of a level are given the freedom to destroy the course's last decent feature...its fairways. Maybe this course was once maintained to a world class standard. That's no longer the case and in comparison to other Egyptian courses, this one ranks very low on the list...well beneath Sokhna, Katemaya Dunes and Palm Hills. Bring you clubs, and by all means, play. But, don't expect much in the way of serious golf. Sorry, but this review does not tally with my experience in October 2017. I played 3 rounds in a week at that time and enjoyed the course very much. Certainly I had no issues about the condition of the greens or fairways, both of which were in very nice condition. This is a very tough golf course, especially in the strong winds which prevail at most times of the tourism season. But I have played golf all round the world, including approximately 35 of the World Top 100 on this website, and so I believe I am qualified to state that this is a very nice golf course indeed. Perhaps the previous reviewer caught the course at a bad time in the maintenance cycle. But when I was there, the course was getting plenty of attention and it looked and played very well. 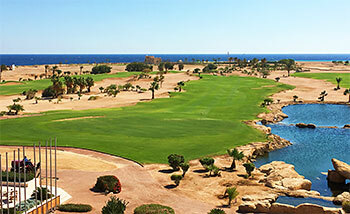 The course at Somabay named Cascades is holiday golf of the highest order. There are no local members and the bulk of the visitors are coming from Germany and the UK and everyone seems to have a great time here. The course is of the desert- style (with plenty of wasteland rather than heavy rough) that is a must in hotter countries in terms of reducing course watering. There are a number of comparisons with this course and the very impressive Assoufid in Morocco – maybe Assoufid has a better collection of 18 holes, although Cascades has more that stand-out in a signature-style. As is common now; tee options cater for all – 5363 to 6998 yards – (we chose the Blues at 6498). First thing to mention is that this is a very windy place making club selection nearly impossible on many holes. There is a strong start on the opening hole; 400 yards turning right halfway to a green protected by water on the right. The 2nd hole is a very clever par-5 – driving over wasteland to a fairway that works its way uphill and to the left with the second shot blind for most. A couple of decent par-4’s at the 3rd and 4th and then to the 5th hole; a mouth-watering par-3 (170 yards Blue). It plays along the coast with a sand surrounded green that butts up to the Red Sea – the normal wind on this hole is a little ‘into’ and from the left making it really hard to score on – this hole reminds me of the 15th at Kingsbarns, Scotland. The short par-4 6th is definitely into the wind, where a decent drive and mid-iron is needed to get the ball the 299 yards to the green! The next standout is the 9th, a good looking par-5 back towards the impressive onsite Westin Hotel with lots to consider; plenty of bunkers at lay-up point for the second shot, then an approach over a creek and with more water on the right of a massive green. One huge thing for me is that this hole is crying out to be the 18th – the current 18th is a par-4, it runs parallel with the 9th but lacks the drama and the fun of the 9th by miles; this would upset the current pars of 36 for each half making them 35 and 37 but if anyone can give me a good reason for not swapping them, I am listening. The back nine like the front has some beautiful holes at the coast namely the 14th and 15th but before then, the 12th has to have a mention – only 309 yards but a split fairway needs a decision from the tee; go left for the slightly shorter carry or go right to leave an easier approach to the green. The 14th get the tag of ‘second signature hole’ (after the 5th) and is another par-3, this time all that is there are the tees and the green – all carry over wasteland and very inviting. The 15th hole is my favourite; only 338 yards with the sea all the way down the left and an approach to a green that is raised and detached from the fairway. The shortest par-3 is the 16th hole and with a rock-face on the left, right and rear of the green gives the hole a nice amphitheatre look about it. The 17th green is great fun with a huge dip in the middle of it (characteristics of the 16th on Red at Streamsong, USA) – The last hole as mentioned earlier is a little straight forward for me; it’s a tough par-4 for sure but if the 9th and 18th were switched, then the round could end on such a high. With plenty of accommodation options and non-golf activities, Somabay is well worth a visit.